Denver Public School Districts - Stars & Stripes Homes, Inc. Important! Many of the school district websites offer an address look-up capability which allows prospective renters and home purchasers to verify which schools a particular home address feeds into. Are schools a major component of your decision making process on which home to rent or purchase? Check out the address you are considering renting or purchasing! Good to trust...but verify...the school district info on line and via phone call with the school district before making a final decision! One of the largest school districts in the state with nearly 80,000 students and recognized as one of the best urban school systems in the country, Denver Public Schools (DPS) was created in 1902 when voters approved a constitutional amendment that created the City and County of Denver and that also consolidated five school districts into today’s School District No. 1. District schools include 73 elementary, 16 K-8 schools, 16 middle schools, 12 traditional high schools, 30 charter schools, and 10 alternative schools, including six intensive pathway schools. One of the Denver area’s largest school districts and the fourth-largest district in the state, the Cherry Creek School District serves more than 51,000 students in 60 schools and programs, including 39 elementary schools, 10 traditional middle schools, 1 alternative middle school program, 6 high schools, 1 alternative high school program, 1 charter school, 1 Challenge school (K-8), and 1 Rocky Mountain School of Expeditionary Learning (K-12). The district is nationally recognized for excellence in academics, the arts, and athletics, and the district’s 2010 graduates earned more than $38 million in college scholarships. One of the Denver area’s largest and most diverse school districts, Aurora Public Schools in Arapahoe County serves nearly 40,000 students in 56 schools, including 2 preschools, 27 elementary schools, 4 K-8 schools, 1 K-9 school, 6 middle schools, 1 academy for grades 6-12, 4 comprehensive high schools, 3 pilot schools, 1 vocational/ technical college, 1 gifted and talented K-8 school, and 6 charter schools. Students come from more than 90 countries and speak more than 100 languages. Innovative district plans include partnering with economic development, higher education, industry and workforce development to offer academic and career pathways in Arts and Communication; Business; Health Sciences and Science, Technology, Engineering and Math at 18 schools by 2015. The Douglas County School District, located between Denver and Colorado Springs, is the fourth largest in the state with nearly 63,000 K-12 students in over 100 schools and programs, including 47 elementary, 9 middle, 9 high schools, 11 charter schools, 2 magnet schools, 1 alternative high school, 1 evening high school, 1 online school, and 34 preschool sessions. Innovative programs and educational approaches include flexibility within each school build its own instructional programs and choices for parents, including open enrollment, charter schools, instruction for gifted and talented students, magnet schools, an International Baccalaureate program, and Advanced Placement courses. The district is one of the state’s highest performing, outperforming the state in grades and subjects tested by the Colorado Student Assessment Program (CSAP). Jeffco Public Schools serves all of Jefferson County and a portion of Broomfield County and is also the largest school district in Colorado with 155 schools, nearly 85,000 students, and 12,000 employees. Schools include 94 elementary schools, 20 middle schools, 17 high schools, 14 charter schools, 10 option schools, 2 outdoor laboratory schools, and 1 online school. The district has received national recognition for its programs, and its students and staff have earned state and national honors. Four district high schools – Lakewood, Evergreen, Conifer and D’Evelyn – were named to Newsweek’s “America’s Best High Schools list” in 2009-2010; and Education Week Magazine ranked Jeffco fifth in the nation for having the highest graduation rates among large school districts. Located just seven miles north of downtown Denver, Adams 12 Five Star Schools is the largest school district located in Adams and Broomfield counties and the fifth-largest district in Colorado. With nearly 42,000 students, more than 5,000 employees, and 52 learning centers, the district’s “five stars” represent the communities it serves, including Broomfield, Federal Heights, Northglenn, Thornton, and Westminster. The district also serves students in portions of Adams and Broomfield counties. The district has received state and national recognition for such initiatives as using business models to improve education, developing innovative community relations programs, and incorporating research-based lessons in the classroom. Located just north of downtown Denver, Adams 14 serves more than 6,700 students in the historic community of Commerce City – an area of approximately 33,000 residents. The district has 14 schools, including 6 elementary, 2 middle, 2 high schools, 2 preschools; 1 pre-K-8 school, and 1 charter school. Known as state and nationally recognized leader in innovative education, Adams 14 has 847 full- and part-time employees and is the second-largest employer in Commerce City. The district provides several school-based health centers and an International Learning Center that offers year-round academic, recreation, and human services for all ages, and before- and afterschool childcare for elementary students. 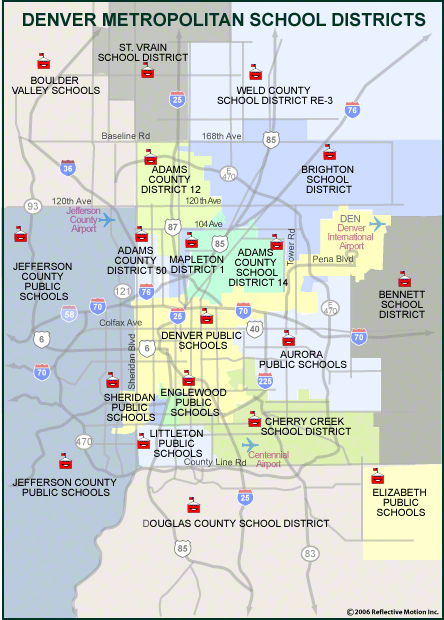 Located just east of Denver, the Bennett School District serves residents within a 289-square-mile area in the central portions of Adams and Arapahoe counties; Bennett and Watkins are the main communities within the district. This small school district has nearly 1,100 students in grades PK-12 in two elementary schools, one middle school, and one high school. Bennett High School offers a wide range of academic programs, including vocational programs. Boulder Valley School District serves the cities of Boulder, Gold Hill, Jamestown, Lafayette, Louisville, Nederland, Superior, Ward, and parts of Broomfield and Erie, covering more than 500 square miles and serving nearly 29,000 students in 55 schools. Known for its academic excellence, the district ranks among the top three of Colorado’s large Front Range school districts, as measured by state and national academic rankings. Voters recently approved a tax increase of nearly $300 million for capital improvements to the district’s 55 schools over the next six years. The Brighton School District 27J serves more than 15,000 students in grades preK-12. The district’s 23 schools include 12 elementary, eight middle, and four high schools. Innovations include one networked computer per every four students, and a health sciences program at Brighton High School that works in collaboration with the Platte Valley Medical Center and Front Range Community College to offer students a curriculum in preparation for a health professions career. A rural school district located about 50 miles east of Denver, Byers serves more than 500 students at one elementary school, one middle school, and one high school that are all located on one campus. The district also offers 3-year-old preschool, 4-year-old preschool, all-day kindergarten, day care, and before- and after-school care. Located approximately 50 miles east of Denver, the Deer Trail School District is located in a rural community and serves about 200 students. The district’s elementary school serves preschool through 5th grades; the junior high school serves 6th through 8th grades; and the high school serves 9th through 12th grades. Englewood is a small suburban community located between the city of Denver and its suburbs to the south, and its school district serves about 3,000 students in eight district schools, including 4 elementary schools, 1 Leadership Academy, 1 middle school, 1 alternative high school, and 1 traditional high school. Approximately 25 percent of all Englewood School District students come from outside the school district, making it one of the top districts in the state in terms of open enrollment. Littleton Public Schools (LPS) is a premier school district located a few miles south of downtown Denver. LPS is nationally known for its academic excellence. LPS is the only school district in the greater Denver metro area to be “Accredited with Distinction,” Colorado’s highest academic accreditation rating, three years in a row. LPS students consistently score at the top of all students across the metro area on state assessment tests. About 90 percent of its graduates are college-bound and earn about $30 million annually in college scholarships. All LPS high schools are nationally recognized; they have been featured as Newsweek Magazine’s Top High Schools in America and 5280 Magazine’s Top High Schools in the Denver area. All three boast regional and state champions in athletics, academics, STEM, and performing arts. Littleton Public Schools is the preferred choice for thousands of students in the area; nearly 20 percent of its students live outside district boundaries and choose to open-enroll in LPS. With a student population of about 15,000, LPS is known for being “big enough to serve you, and small enough to know you.” LPS offers a comprehensive education from preschool through grade 12. It offers National Blue Ribbon Schools of Excellence and a high school International Baccalaureate program. LPS leads the country in 21st Century learning. More than 14,000 computers, laptops, and netbooks are in use by students and staff every day. LPS serves 28 square miles and includes the majority of the city of Littleton, town of Columbine Valley, and portions of the municipalities of Bow Mar, Centennial, Greenwood Village, and Englewood. The Mapleton School District covers 25 square miles and serves nearly 6,000 students in grades preK-12 at its 17 schools, which include one pre-K; 3 elementary schools; 5 middle schools, and 7 high school, alternative and charter schools. Innovations include the district’s Connections Academy – an online K-12 school – and Mapleton’s Choices for Learning portfolio allows students to choose the school that best matches their learning style. Located in Arapahoe County, the Sheridan School District serves more than 1,600 students from preschool through 12th grade in five schools: 1 early childhood center, 1 primary school, 1 elementary school, 1 middle school, and 1 high school. The high school offers a differentiated diploma program, which includes a diploma that provides Sheridan students an opportunity to receive a degree from Arapahoe Community College. More than 50 percent of Sheridan’s students enroll from out of district during open enrollment. Located approximately 30 miles north of Denver, the St. Vrain Valley School District is the ninth largest school district in the state, serving more than 26,000 students in parts of four counties (Boulder, Broomfield, Larimer and Weld), and in 13 communities, including eastern Boulder, Broomfield, Dacono, Erie, Firestone, Frederick, Hygiene, Longmont, Lyons, Mead, Niwot, Peaceful Valley, and Raymond. The district’s 49 schools are spread over 411 square miles and include 25 elementary, 9 middle, 1 middle/senior, 7 high schools, 2 alternative schools, and 5 charter schools. The district has met 96 percent of its targets for student achievement; the graduation rate for high school students is 86.6 percent; and 28 percent of all juniors and seniors took at least one advanced placement (AP) course.